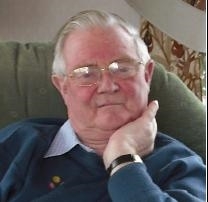 Colin passed away peacefully at Hereford County Hospital on Thursday, September 20th, 2012, aged 74 years. Dearly loved husband and best friend to Ann, devoted father to Gill and Libby, father in law to Rob and proud grandpa of Thomas and William. A Service of Thanksgiving was held on Friday, September 28th, at St Michael's Church, Breinton at 3 p.m., following a private Burial. Family flowers only but donations if desired to Arthritis Research UK and the British Lung Foundation. Colin Powell passed away on 20th September 2012 aged 74. Colin was born and bred in Herefordshire. Whilst at Hereford Cathedral School his favourite lessons were spent at Wyeside playing cricket and when not at Wyeside in School Yard during breaks. Colin was one of the last intakes of men for National Service and although based at Reading for most of the time, he was allowed back every Saturday to play football for Hereford United Colts team - he was a well known footballer in his teens, being an excellent goal keeper. Following National Service he returned to Hereford to work with his father at Passy Nott & Co Ltd, a corn and agricultural merchants based in Hereford and Kington. It was here that he earned the nickname ‘Passey’. Colin married Ann in 1965 and they had two daughters Gill (OH 1979-1986) and Libby (OH 1984-1991). While the girls were young he continued to play cricket for Almeley Cricket Club. He loved his cricket and always opened the batting, usually scoring a high number of runs. He later became a Vice-President of Almeley Cricket Club. Unfortunately as rheumatoid arthritis set in his active cricketing days came to an end but he continued a lifelong interest in the game which was his passion. During his retirement Colin was always busy, he was a very keen gardener and enjoyed being outside, he was treasurer of the local Arthritis Association and of Breinton Church for twenty years, Treasurer of Breinton Village Hall Committee and Treasurer of Hereford Cathedral Perpetual Trust.